For better or for worse, much of what we know about wartime beliefs and attitudes comes from bickering, mostly of a partisan political nature, between the various editors of Lancaster's newspapers. We infer that sometimes people would just roll their eyes when Editor X got his feathers ruffled over something Editor Y said, and I even recently read a soldier's letter published in the Lancaster Daily Inquirer that said to one of the editors not to take the controversies so seriously as Lancaster's reading population basically didn't. However, sometimes these squabbles really did have significance as they outline the topography of opinions on questions such as: How does one oppose the war without being a traitor? What was the real purpose of the war? How does slavery tie into that purpose? Who was and wasn't pulling their weight when it came to fighting the war? So, as a case study, let's look at a row from August 1861 centered around the unique and interesting character of Josiah Rhinehart Sypher (b. 1832), a man whose wartime occupation could (honestly) best be described as a "gentleman adventurer." Though independently wealthy, Sypher was trained as a lawyer under Thaddeus Stevens and spent the war mostly traveling with the armies, primarily with the Army of the Potomac, but also occasionally in the West where his brother commanded a section of an artillery battery that actually once went on an expedition with the 79th Pennsylvania. During occasional stops to Lancaster, Sypher agitated for certain political and social causes, like education reform, the temperance movement, and a pro-Republican agenda for prosecuting the Civil War. As the war drew to a close in 1865, Sypher published one of the first Civil War unit histories ever written, History of the Pennsylvania Reserve Corps--a division of Pennsylvanians that fought with the Army of the Potomac--and later wrote other history and education books. 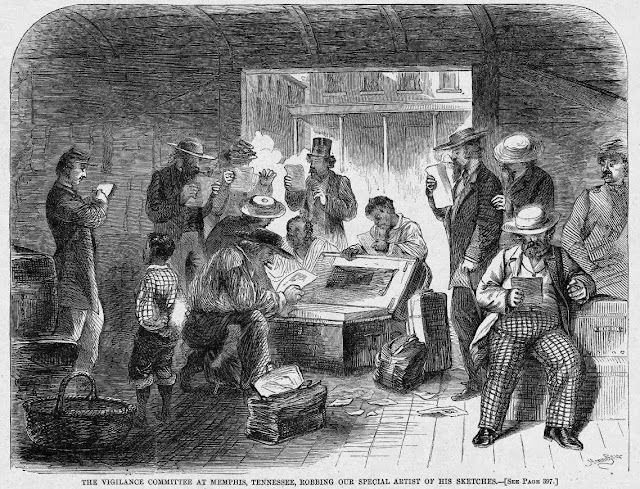 Sypher's correspondence while following the Army of the Potomac also found their way to the pages of the New York Tribune, qualifying him as some sort of war journalist. In mid-August 1861 (maybe 8/11 or 8/12), Democrats held a rally at Drumore Centre, a crossroads in southern Lancaster County. The Democratic press portrayed them as hardworking laborers now prepared to fight the war that abolitionists had started but were too afraid to fight, and the Republicans portrayed them as traitors who hailed the Confederate victory at First Bull Run. Mayor Sanderson's next issue on August 27 did not address the issue specifically, so I'll stop here. There is plenty of good material though from the August 1861 Intelligencer editions (available to browse here) in which the Democratic Party claims an identity as a party of "Peace, Law, and Order" (8/27) and the party that would actually be supplying the soldiers who comprised the Union army. As the 79th Pennsylvania goes to war, expect the newspapers editors in Lancaster to find many more trivial and substantial issues over which to quarrel, many of which related directly to the regiment. Soldiers' diaries and letters show that they definitely paid attention to what was going on in Lancaster, and we also know that there was a constant flow of newspapers from printing presses on S. Queen St. to camps in Kentucky and Tennessee.